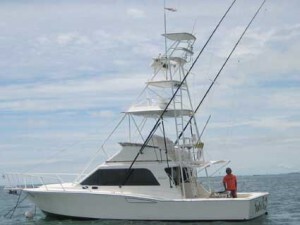 Sport fishing on the high seas is one of the most popular Costa Rican outdoor activities. thousands of fishermen annually and attracts a high percentage of tourism. Pacific waters are abundant with big fish. 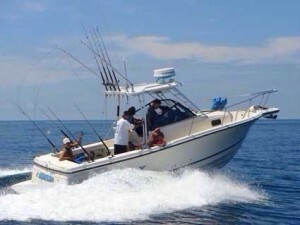 Many would agree that Costa Rica is the undisputed capital of sport fishing in the world. We offer a wide variety of charter trips to meet all your fishing needs. For those who want to go for the big billfish there is a full day of preparation of letters of sea water and a half deep. For those who want calmer waters and not as intense training rocks and reefs off the coast also they offer great fishing and still there two days and a half day of full letters coastal development in all our boats. Max Capacity: Max 12 People. All Included: 55 feet bot… Snacks, Sandwich, Sodas, Bottle water And A Lot Of Beer. Features: 450 HP CAT, Armoured, Fish Finder, VHF radio, GPS, stereo, captain and mate. High Capacity: Max 6 Persons. All inclusive snacks, Sandwich, Chicken, sodas and a lot of beer. Time Half Fishing: 7:00 to 12:30 md. All Included: Snacks, Sandwich, Chicken, Sodas And A Lot Of Beer. All Included: Snacks, Sandwich, Chicken, Sodas, Battles of Water And A Lot Of Beer. Costa Rica is certainly a fishing paradise that we can appreciate and love the experience. 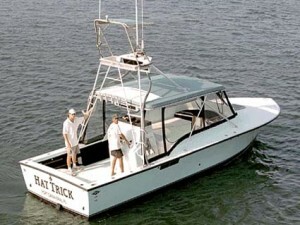 We offer several offshore fishing boats, which vary in size and amenities. Enjoy the hard work and knowledge of each captain and mate in our fleet! Sunscreen, hat, sunglasses and camera. If you get dizzy, you should take a drug or natural remedy dizzy last night and again on the morning of day. We have access to over 45 Fishing Charters, lets us know the group sizes and We will recommend the best boat that fits your needs.